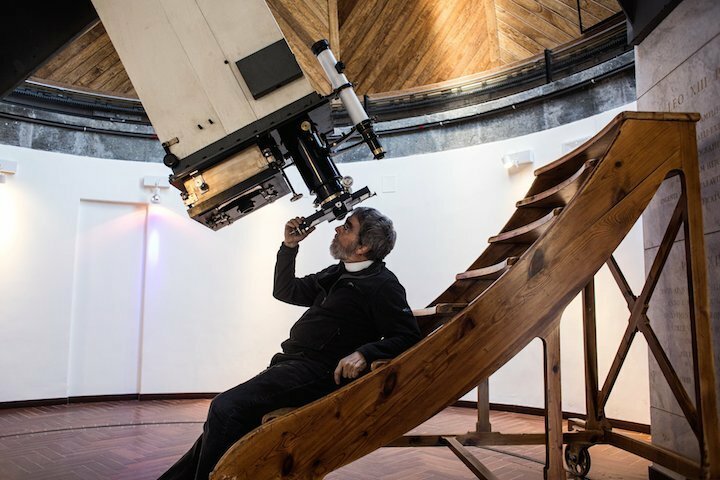 Brother Guy Consolmagno, the director of the Vatican Observatory, looking through the “Carte du Ciel” telescope. ALBANO LAZIALE, Italy — Some 2,000 years ago, a celestial phenomenon is believed to have lit up the sky. Guiding the wise men of New Testament lore to the birthplace of Jesus, the star of Bethlehem has since become a planetarium and Christmas carol favorite. He sees it as a multifaceted mission: convincing the world that faith and science coexist and complement each other; dispelling the notion that the church has sought to muzzle scientific advancement, perpetuated by some high-profile historic cases like the travails of Galileo and Giordano Bruno at the hands of the Inquisition; and being part of the conversation within the global scientific community. When it comes to science, the Vatican — supporters say — is a victim of historical fake news. How many people know that the Vatican built its first observatory in the 16th century to study astronomy for the reform of the Gregorian calendar? Or that a 19th century Jesuit priest, Angelo Secchi, is considered a pioneer of astronomical spectroscopy, “the beginning of astrophysics,” as Brother Consolmagno said? Or that 90 years ago a Belgian priest, Georges Lemaître, put forth a theory on the expanding universe that became what is known today as the Big Bang? The observatory has a unique advantage. The Vatican’s unconditional support of the institute means it is able to engage in long-term astronomical research, freed from the constraints of goal-oriented funding and grants. “The work we do here can take 10 or even 20 years before it bears fruit and the Vatican is happy to bear it,” Brother Consolmagno said. “It means we can do the kind of useful but not very glamorous work that the rest of the field needs but that no one can afford to do.” For example, measuring the physical properties of meteorites, data that is widely used, “but will never win a Nobel Prize,” he said. A Detroit native, he first thought about following in his father’s footsteps and studying journalism. So he majored in history at Boston College, before transferring to the Massachusetts Institute of Technology to pursue science “Originally I had the idea of being a science journalist, but the science itself was too much fun to pass up,” he said. He quit academia and joined the Peace Corps, moving to Kenya in 1983 to teach first high school in rural areas and then university. He returned from the Peace Corps “filled with this passion to teach astronomy” and began working at Lafayette College in Easton, Pa. “I was never as happy as I was there, teaching at a small college and I realized this is what I wanted to do for the rest of my life,” he recalled. At that point, nearing 40, he decided to join the Jesuits. “I’ve always been in love with my faith, I enjoy being a Catholic, and so I thought about becoming a brother, living with the Jesuits in community,” he said. Eventually, he was called to the observatory. The Vatican had in-house observatories until the 1930s when light pollution in the Italian capital began interfering with sky watching, so they transferred the institute to the papal palace and gardens at Castel Gandolfo, where popes have summered for centuries. In 2009 the observatory decamped for new lodgings in a remodeled monastery on the Albano Laziale side of the papal gardens, just next to the working farm that provides the pope with vegetable and dairy products. 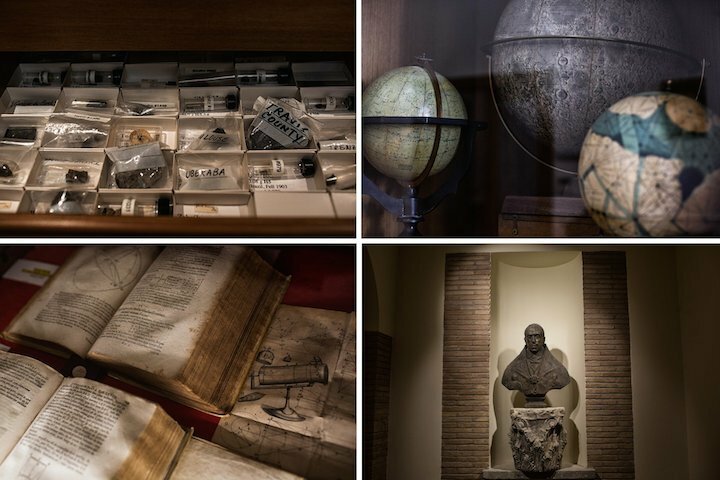 Clockwise from top left: a collection of meteor samples in the labs at the Vatican Observatory; replicas of the earth and the moon encased in a museum; a bust of Pope Pius XII in the ground floor of the Carte du Ciel Telescope dome; books on display as part of a permanent installation at the Vatican Observatory. “There are three vows that even Jesuit brothers take: poverty, chastity and obedience,” said Brother Consolmagno. “And the running joke is, if this is poverty, show me chastity,” he laughed. The new digs have made it easier to host visiting scholars as well as the students that every two years participate in a monthlong summer school taught by leading astronomy luminaries. Its alumni are ensconced in dozens of universities and institutes. There are four telescopes under domes at Castel Gandolfo, and on a chilly morning Brother Consolmagno draped rather awkwardly on a reclinable chair, peered gingerly into the viewfinder of one: a 19th century model used when the Vatican was one of 20 observatories to participate in the Carte du Ciel astronomical project to map millions of stars on photographic plates. “In our history, we’ve done some fundamental things that we will be remembered for,” and that was one of them, he said. Next year, the Observatory and the Vatican Museums hope to allow paying visitors to experience nighttime sky watching through this telescope, situated in a dome where Pope Paul VI watched the moon landing and gave a short address to the astronauts. On Oct. 26, Pope Francis had a much longer conversation with the astronauts on the International Space Station. “Astronomy makes us contemplate the universe’s boundless horizons and prompts questions such as ‘Where do we come from, where are we going?’” the pope said. A longer answer included the bemused rejection of tabloid mediasuspicions that the Vatican has been hiding proof of the existence of alien life. In terms of real research, however, none of the observatory’s Italian telescopes are suitable, so for the past three decades the observatory has also operated a modern telescope in partnership with the University of Arizona on Mount Graham, with a logistical base in Tucson. The staff of the observatory travel back and forth between the two sites, often gathering data in Arizona and studying the results and planning new observations in Lazio. “We’re migratory birds,” said Brother Consolmagno. Brother Consolmagno’ spends about a third of his year on the road. “I come cheap and I tell funny stories,” he joked. He is also a tireless communicator, through books, articles and blogs. He has a monthly column in the Catholic magazine, The Tablet, writes regularly for the Vatican house organ, the Osservatore Romano, and manages the Vatican Observatory’s blog The Catholic Astronomer. Brother Consolmagno counts himself as lucky. “The glorious thing to me of being a Jesuit brother, it’s the one place that allowed me to use all the things I love to do,” he said, contemplating the way the universe works. “It’s not only logical, which is amazing in itself, but in its logic it is beautiful,” he said. And it is a constant sign of God’s presence. “God wants us to be happy, God wants us to be joyful, and we are hoping we can communicate some of the reasons we find joy in the stuff we do,” he said.